Mechanically interlocked molecular compounds can be synthesized in high yields by using template-directed assistance to covalent synthesis. Catenanes and rotaxanes are two classes of mechanically interlocked molecules that have been prepared using a variety of methods such as “clipping”, “slipping”, and “threading-followed-by-stoppering”, under both kinetic and thermodynamic regimes. 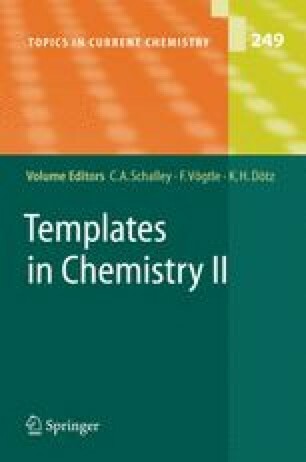 These different methods have utilized a range of templates such as transistion metals, π-donor/π-acceptors, and hydrogen-bonding motifs. Multivalency has emerged as another tool to aid and abet the supramolecularly assisted synthesis of mechanically interlocked molecules. Recent advances in our understanding of the nature of the mechanical bond has led to the construction of molecular machines with controllable motions that have, in one instance, been introduced into molecular electronic devices.